Learn how to use personalization techniques and automation technology to nurture your talent pipeline. 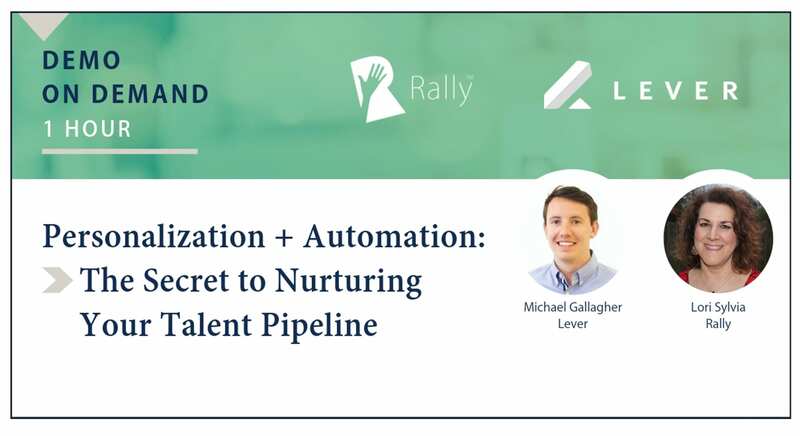 Michael Gallagher, Senior Sales Recruiter from Lever, shares his pro tips for keeping talent pipelines warm and driving engaged candidates to apply and shows how he puts these tips into practice using the Lever Nurture platform. Length: 1 Hour. Lever was founded to tackle the most strategic challenge that companies face: how to grow their teams. We’re injecting the values we respect – collaboration, transparency, and humanity – into our software and re-imagining how organizations can think about growth, with talent and teamwork at the center. To learn more about Lever, visit https://www.lever.co/. The Lever is a sponsor of Rally. Their sponsorship fee helps us to create educational content and events on Recruitment Marketing.